Welcome to the University of Chicago. If the manicured quadrangles did not tip you off, you have arrived at one of the most intellectually rigorous and prestigious research universities in the world. But I’m sure you already know this. I’m sure you’ve already looked up the rankings of the school and your particular programs, crosschecked them with the schools that rejected you, compared them with the school that that one kid from your high school got into. If you are an incoming First Year, I’m sure you’re a bit anxious about starting classes, a bit uneasy about those things that you saw on your roommate’s Facebook page. And I know some of you are rapidly wondering where you can buy fresh goji berries or coconut water in Chicago. Don’t worry. I’m sure they’re here somewhere. However, before you allow the pomp to confer upon you either a sense of accomplishment and/or an obligation to be unendingly brilliant, I kindly ask you to find the courage this year to be an absolute nobody. Last year, before setting foot on campus, I made the mistake of Googling the notable University of Chicago alumni, assuming that in some absurd and distant way me and say, Philip Glass, were now somehow connected. We aren’t. At all. Before I arrived in Hyde Park I had visions of the kind of buildings Kurt Vonnegut Jr. smoked outside of, the apartment ashtrays Susan Sontag filled, the academic buildings Hannah Arendt crouched behind to light her cigarette, and I wanted simply to be there. I thought that somehow inhaling their long-gone secondhand smoke would inherently make me a more interesting person. It didn’t. Instead, these floating heads of abstract success only served to cloud my mind. Just as it is hard to walk upright while carrying eighty dead geniuses on your shoulders, it’s hard getting on with your intellectual work when many, if not all of your ideas, ring hollow when compared with the stamped greatness of acclaimed authors. After Philip Roth, who needs to write another sentence? And therein lies the danger of comparisons: there’s always somebody better. ACT ONE: Short Response Essay. 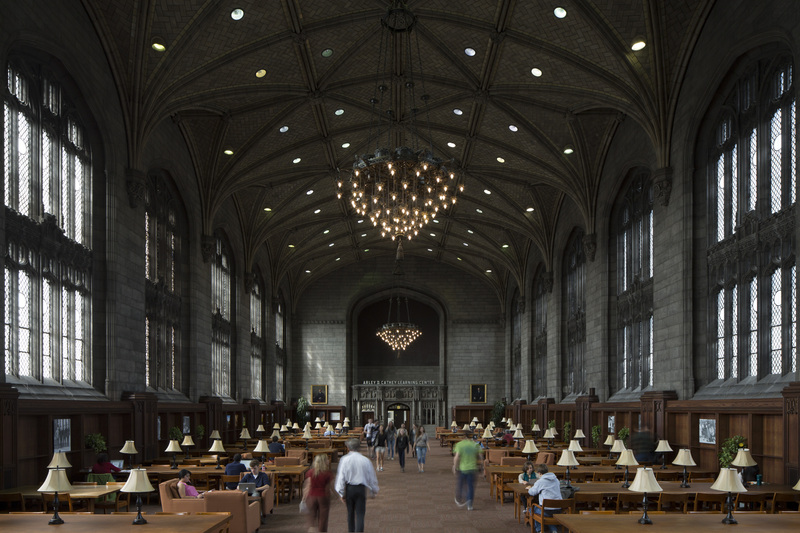 SCENE: Harper Reading Room. I was that student. The role I thought I needed to play wore on me. While the facilities at the university are certainly incredible, studying in such ornate spaces can be overbearing. And at times I felt that students were less focused on studying than they were in carving their initials very carefully into Harper’s wooden tables. It took me about halfway through last year to realize that a lot of energy is lost in the business of trying to be somebody and, if I wanted to get any serious work done (particularly on my M.A. thesis), I had to embrace my own anonymity. There is no place in Chicago where one can become nobody as thoroughly, or as quickly, as on the CTA. For those new to the city, take a seat (if you can find one) on the #6 bus and you’ll be amazed at how little you and your intellectual pursuits mean to your fellow CTA passengers. Instead, your worth on the CTA can be evaluated by answering a short questionnaire: 1) Are you in my way? 2) Are you being loud? 3) Are you looking at me? 4) Are you talking to me? 5) Is that drink you’re holding going to spill on me? The more forgettable you are on the CTA, the better. Just as your fellow passengers don’t care to know your background, you too will grow unconcerned with the accomplishments in their life. Well, maybe you’ll appreciate the ones who achieved a shower that day, but for the most part, comparisons end. Instead, free from distractions (your phone will most likely lose service) you will have the time to read or think in this peaceful space of transitory anonymity (assuming that you don’t get motion sickness). In fact, I found that the CTA is actually one of the most popular reading spaces in Chicago. Next time you are on the bus or train, take a look around and you’ll see that your average CTA passenger is likely to prefer a book over the faces of their fellow passengers or the Chicago skyline. And, unlike the libraries on campus, the general goal of the CTA is not to see how long you can stay, but how quickly you can get off. I know. Public transit is not immediately an enticing sell. But, for the sake of absurdity, try it once. Wait for a bus long enough to understand your true importance to Chicago. Be bold. Refuse to give up your seat to the middle-aged woman balancing precariously on the train in front of you. Take the Blue Line toward oblivion and let the hissing tunnel static erase your mind. Of course you have to get off at some point, but the beauty of the CTA is that it gives you access to the many, less Nobel Prize-laden neighborhoods of Chicago. Take the Pink Line to Pilsen. Get the Blue to Logan Square. Ride the Red up to Lincoln Park or Lakeview. Coming into contact with life outside of the university is a good reminder that Chicago is more than its university, and that the life of the mind is in fact everywhere. Finally, when at a place as endlessly accomplished as the University of Chicago, it is important to avoid constructing grand narratives about yourself and your collegiate career. Those stories that you tell yourself in your head rarely come true and, if they do, usually make for boring stories anyway. But consider how many great stories began with the phrase “So I was on the train and….”? Granted, these tales might not tell of particular accomplishments, but they do not set themselves against imaginary rubrics of success. Besides, the emotional shelf life of good news at this school typically lasts only as long as you are able to repress future deadlines. Perhaps I’ve painted a grim picture. I don’t mean to alienate you from your ambitions or to shun hard work. Instead, I’m only suggesting that the picture of achievement that you have in September might look different once the leaves are off the trees. Meaningful success, I believe, almost always comes as a surprise. On the CTA, there is only one narrative passengers tell themselves: I will take X bus to the Y stop in order to arrive safely (and preferably dry) at my desired destination. Ambitions on the CTA could not be lower. However, during my time at UChicago I learned to appreciate such small stakes, not because the university sapped my ambitions, but because such simplicity of purpose opens up the world for untapped areas of thought. When you are not expected to think of anything, you can usually think of everything. It was outside of a Brown Line window that I found the central argument of my master’s thesis. I filled in the gaps on a different day on a Blue Line toward the Loop. While I know better than to doubt the fierce individualism of a University of Chicago student in September, I personally found that I did my best intellectual work not as a student vying to squeeze between the shoulders of the university’s famous alumni, but as an anonymous CTA passenger pressed between two ill-humored Chicagoans on their way downtown. This year, particularly around sixth or seventh week, I’d encourage you to, just for a short while, let someone else set the wheels in motion.